For those that are unfamiliar with the Chinese New Year (also known as the Spring Festival, or Lunar New Year in the U.S.), it is one of the most important celebrations among Chinese populations around the world. 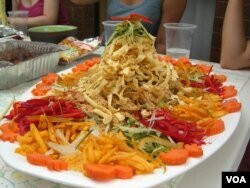 On Chinese New Year’s eve, the entire extended family will gather for a reunion dinner, which is a time of fellowship. In Malaysia, where I'm from, no reunion dinner goes without a tossing of yee sang (usually a mixture of shredded vegetables, raw fish, sauces and other ingredients), my favorite dish of the celebration. The tossing of yee sang symbolizes the action of wishing one another a great year ahead filled with abundant health, prosperity and happiness. This Chinese New Year is a very different one for me, and for many other international students. It will be my first Chinese New Year celebration away from home, and I am beginning to feel just how different it will be. 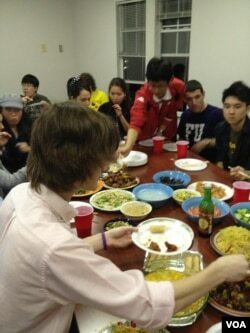 This Chinese New Year began with a “reunion dinner,” which we organized ourselves. We cooked some traditional and favorite dishes (or rather, the ladies did :D), and had dinner together. It was a first for many, the locals and internationals alike. For me and many others, it was the first time we spent the reunion dinner without our family. For some, it was their first time trying their hands at cooking. The result was a celebration filled with diversity and uniqueness. And the curiosity of my American friends who joined us for their first-ever reunion dinner made the celebration ever more interesting. My mum was also rubbing it in about how they have a week off, as Chinese New Year is a major public holiday in Malaysia, always celebrated in its full glory. By contrast, I have a paper due on the first day of Chinese New Year. But I'm still looking forward to the Chinese New Year-themed dinner that the university has organized for the entire student body. Despite missing out on some of the traditions from back home, I am optimistic of what this Chinese New Year has to offer, and I wish everybody a great year ahead filled with prosperity, good health and happiness! Happy Chinese New Year and Gong Xi Fa Cai!